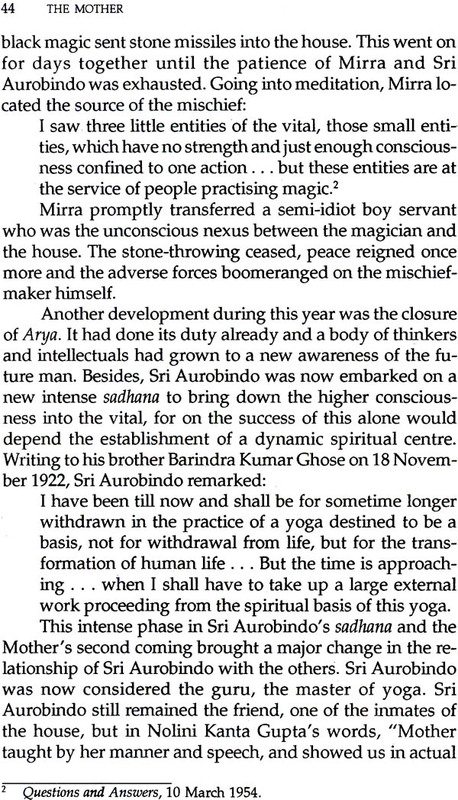 Born in Paris to wealthy parents, Mirra Alfassa's spiritual quest brought her to India where she joined forces with Sri Aurobindo for the realisation of his vision of the future. She was the main force behind the setting up of the Sri Aurobindo Ashram at Pondicherry, and while Aurobindo was the guru, she became the 'Mother' to the inmates of the Ashram. Their vision of a world populated by 'superconscious' men is of special relevance today, when most of the civilized world, recoiling from the 'progress glut' is trying to remove the disharmonies it has inherited inherited in the wake of technological advances. 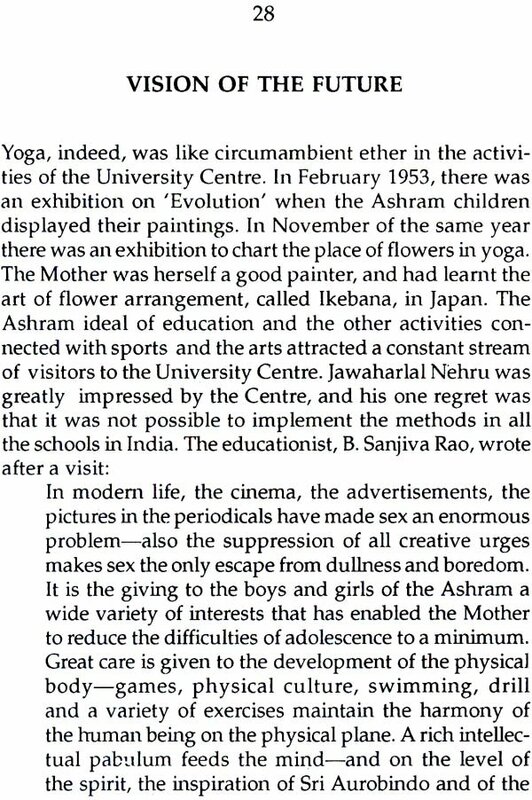 The benign and fascinating personality of the Mother is brought to life in all its vividness and complexity in this short biography published on the eve of the mother's centenary on 21 February 1978. Prema Nandakumar is well known for her standard critical study of Sri Aurobindo's Savitri and for her learned books on poet Bharati's life and works and sensitive renderings of his poems into English. 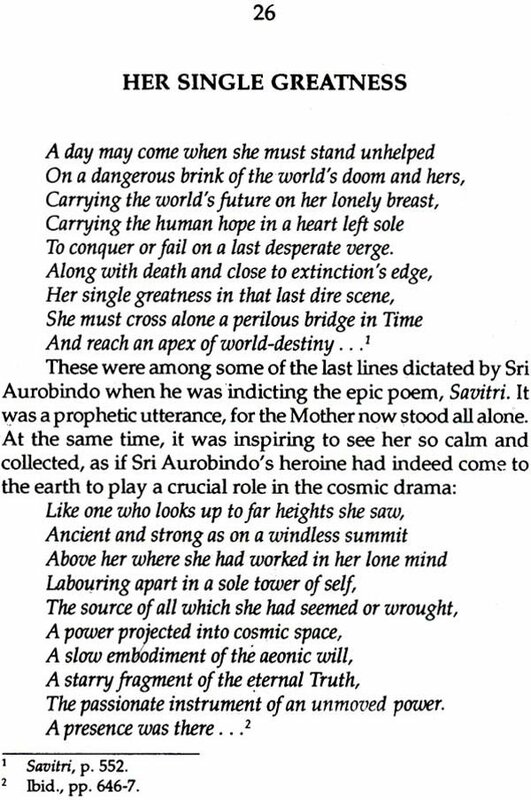 As a child, she grew up ' in an environment where the Mother and Sri Aurobindo were living presence'. This is reflected in the perceptive descriptions of the Mother-her vision, and the efforts to realize that vision. There have been several illustrious women from the West who chose India as their sadhana kendra, field of action and realisation. Sister Nivedita, Annie Besant, Ida Scudder, Mira Behn, Sophia Wadia, Mother Teresa ... the list grows long. These elect spirits came, casting aside the comforts of their homes, to suffer, sacrifice and build a new life for the people of their adopted country, India. The ministry of Mirra, the Mother of Sri Aurobindo Ashram, Pondicherry, had a similar impulsion, and achieved truly phenomenal results. Born on 21 February 1878 in Paris, she first came to Pondicherry in 1914, and joined forces with Sri Aurobindo for the realisation of his vision of the future. After his passing in 1950, she remained in India to continue his work which was verily the transformation of human con- sciousness and the establishment of Life Divine on the earth. At the age of ninety-five, the Mother withdrew from the physical sheath that was her consecrated body on 17 No- vember 1973. As the architect of Sri Aurobindo Ashram and as the inspiration behind' Auroville', the City of Dawn, the Mother will forever remain a potent and living force in the earth atmosphere. I was pleasantly surprised when the National Book Trust, India, asked me to write a short biography of the Mother, for I knew at once that it was a formidable, even an impossible, task. Nevertheless, encouraged by my father, Professor K.R. Srinivasa Iyengar, I accepted the assignment though not without a measure of diffidence. Since my childhood thirty years ago, I have grown in an environment where the Mother and Sri Aurobindo were living presences. 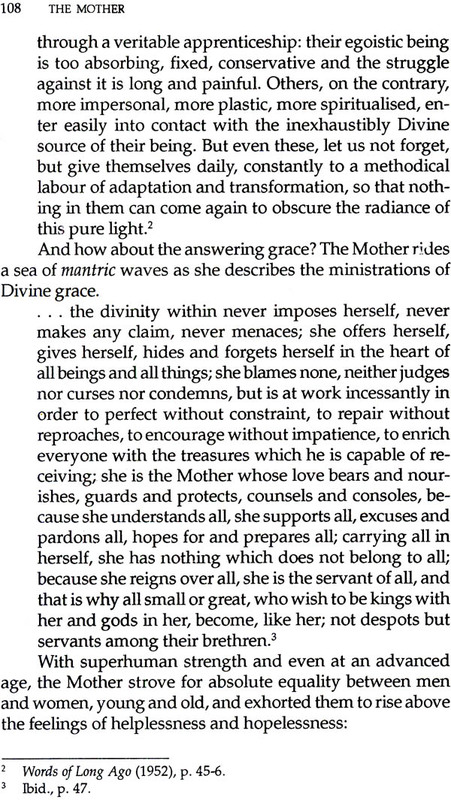 After I had completed my book, A Study of 'Savitri', I was permitted to have darshan of the Mother, and during the fifteen minutes I was with her in my father's com- pany (that was in 1961), I found her verily incarnate grace. How is one to attempt a biography of that power and per- sonality? During the last year, my father has been revising and greatly expanding his earlier On the Mother (1952), and he readily placed in my hands the manuscript of his compre- hensive study of the Mother. My work was thus rendered easy, for in the main I had only to select what I needed for my purpose, and present the material in my own way. My father has also gone through my first draft, and made many suggestions towards its improvement, which I have grate- fully incorporated. I am thankful to the copyright department, Sri Auro- bindo Ashram, for permitting me to use quotations from the writings of Sri Aurobindo and the Mother.